Create an EMOJI FLOWER POT for your mom on Mother's Day! 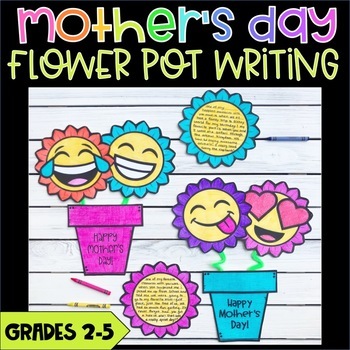 This product comes with 11 flower emojis--each with a different writing prompt. 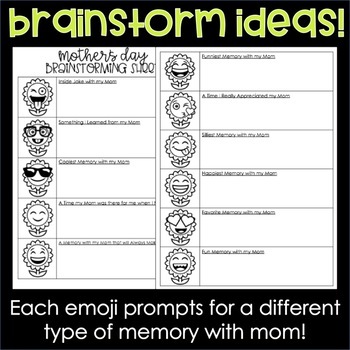 Give students a brainstorming sheet so they can brainstorm memories associated with each emoji. After brainstorming, let students choose their favorite emoji/memory that they want to use for the project. 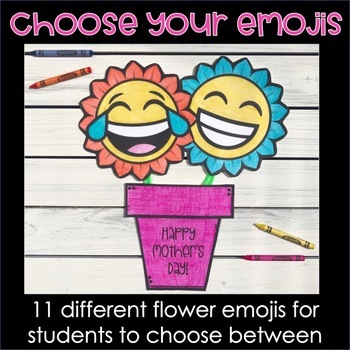 Students can choose just one, or as many flower emojis as they would like for their flower pot! Flowers with lines (both single and 1.5 spaced) are included for students to write down their memory. Students should attach the writing behind their flower emoji. 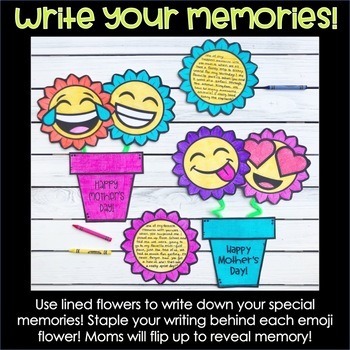 Moms will flip up the flower emojis to reveal the special memory underneath! Blank Flower (Students can create their own emoji, draw a picture, etc). Print flower emojis and flower pots on heavy cardstock paper for durability. Please be sure to take a look at the preview for a sample of what is included in this product. If you have any questions regarding this product, please ask prior to purchasing! Thank you!